As avid outdoorsmen & women ourselves, we're always on the pursuit of our next adventure & getting away from it all. That could mean taking our families out on your next camping or kayaking trip (preferably outside of cell range so it actually counts as "family time"), or heading out deer or elk hunting. Anytime you leave the blacktop to get to these adventures you end up needing to bring a bit of extra gear. That's where Vault Cargo Management's cargo hitch carrier comes into play! Our tailgate basket boasts a 500 lbs capacity - that's PLENTY of capacity to haul a full cooler, some camping gear, and more. This means that you should have zero issues getting to your camping or hunting spot, with plenty of room for all your gear! Our personal preference is to throw all the gear that shouldn't get dirty in the back of the truck or SUV, and then throw our iced down cooler & totes on the cargo hitch carrier. After all, you never know when you'll need a little extra room on the way home, and the rest of the family doesn't necessarily appreciate having to ride back with gear on their lap! Grab your Vault Cargo Management cargo hitch rack today for a bargain, and have the confidence to get way out there on your next adventure! 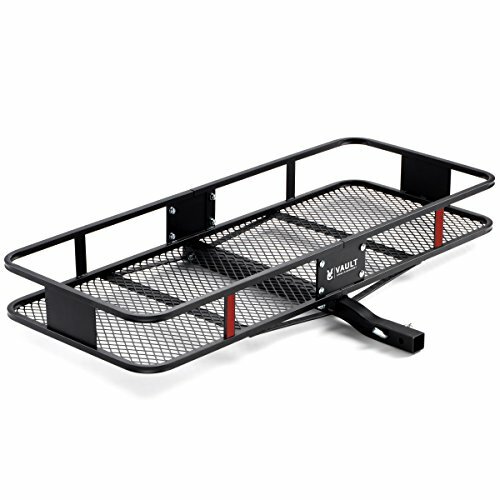 ✓ 60" x 22.5" Cargo Basket - Perfect rack size to haul coolers, luggage, camping gear and more! ✓ 500 Lbs Capacity - Load that cooler up full, and throw all that extra camping gear in the basket! Heavy Duty Steel Construction, Be Sure to Inspect Delivery! ✓ Elevated Shaft - To raise your cargo over your exhaust & prevent your gear from smelling like gas! ✓ Compatible with 2" Receivers - Plug this cargo carrier into your hitch and hit the open road! ✓ Universal Mount - For use with your truck, SUV, car, or RV. Extra storage space for your travels! If you have any questions about this product by Vault Cargo Management, contact us by completing and submitting the form below. If you are looking for a specif part number, please include it with your message.